My boys sitting in the top arch at Double Arch. Overview. Double Arch Trail is a relatively easy hike that takes you down to the forest floor and back up to an outstanding view of Auxier Ridge. With a short scramble, you'll enjoy a 300-degree view of Red River Gorge. Trail navigation. From the parking lot, the trailhead is located just to the left (west) of the Auxier Ridge Trail. Follow this trail 1/10th of a mile to intersect with the Forest Service road. Continue on this for 1.4 miles to the Double Arch Trail sign. From here, descend down to the forest floor and continue north until you begin the ascent to Double Arch. You'll reach the bottom of the arches at mile 2.45. If you are comfortable scrambling to the top, there is a set of heavily worn 'stairs' cut into the rock located to the right (south) of the arch. Once on top, move north to enjoy an excellent 300-degree view of Red River Gorge. CAUTION. 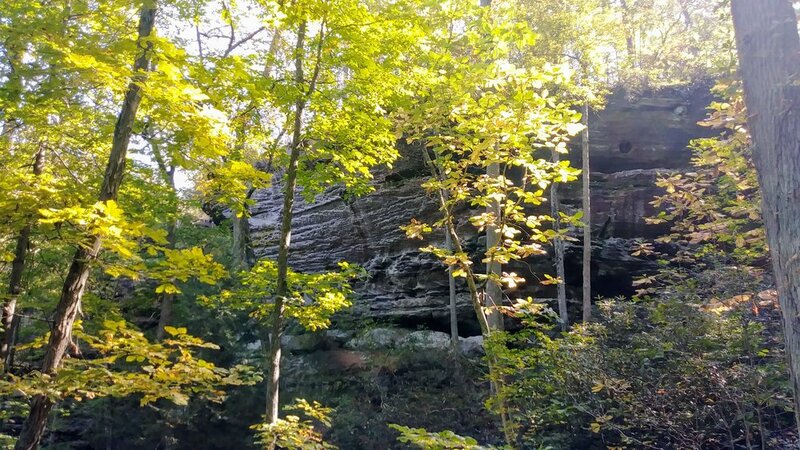 Be careful to avoid getting too close the edge of cliffs, as this is the leading cause of serious injury and death when hiking in Red River Gorge. Also, do NOT attempt the scramble to the top of Double Arch unless you are physically and mentally up to the task - the views from inside the arch are good enough! HIking map to Double Arch. Elevation profile of hike to Double Arch. Signs at the Double Arch Trailhead. A rock outcropping on the initial descent on the Double Arch Trail. View of Auxier Ridge from inside the lower arch at Double Arch.